As a NIMBioS postdoctoral fellow, Clemente Aguilar (Ph.D. Computational Science/Biology, Univ. of Texas at El Paso, 2013) designed computational methods to identify short fragments of proteins capable of producing and immune response. As the discovery of small molecules is not easy using conventional methods, time and money can be significantly reduced by using computerization. Characterizing molecular fragments has the objective of assisting in the development of vaccines, immunotherapies and diagnostic tools. 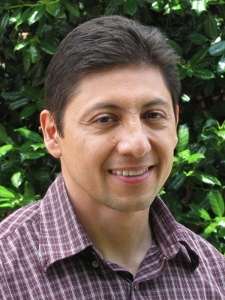 Upon completing his fellowship at NIMBioS, Dr. Aguilar accepted a position as a postdoctoral fellow in the department of biostatistics at MD Andersen Cancer Center in Houston, TX., working on the application of novel statistical and computational methods for the analysis of complex high-dimensional omics data. Aguilar-Bonavides C, Cruz-Cano R, Lanzas C. 2014. Prediction and rule extraction of major histocompatibility complex class II epitopes by logic minimization. Proceedings of the International Conference on Bioinformatics & Computational Biology (BIOCOMP), pp 167-173. The Steering Committee of The World Congress in Computer Science, Computer Engineering and Applied Computing (WorldComp). Aguilar C. July 2014. Prediction and rule extraction of major histocompatibility complex class II epitopes by logic minimization. 14th International Conference on Bioinformatics and Computational Biology BIOCOMP'14, Las Vegas, NV. Carolina Romo, National Institute of Pediatrics, Mexico City. Dr. Romo's lab is investigating the bacterium Helicobacter Pylori, and they are also interested in testing predicted epitopes. Testing with H. pylori was not part of my original NIMBioS proposal, but the algorithms are working with different pathogens. I have predicted the epitopes for this organism, and we are working on the manuscript with the results of the computational prediction. Alexandre Ferreira Marques, Universidade Federal de Minas Gerais, Brazil. Dr. Margques' lab is interested in testing predicted epitopes from the parasite T. cruzi. To perform the testing, they have infected mice and serum from infected human patients. I have obtained predicted epitopes, and his group is currently testing the predictions. Mentored undergraduate students for their participation at the 5th Annual Undergraduate Research Conference at the Interface of Biology and Mathematics, November 16-17, 2013. Poster: "Using bioinformatics to efficiently organize and analyze significant immunogenic epitope sequences in various stages of Trypanosoma cruzi"